Bramble Hub 'connect private sector suppliers with public sector organisations through government procurement frameworks'. When they were looking to update their website they were keen to use Squarespace. Squarespace is a 'popular and powerful website publishing and hosting platform'. Build14me had not used the platform before but we were keen to see how it worked and more importantly how we could ensure that Bramble Hub had the site they needed using a platform more usually associated with 'award winning design' portfolio style sites. 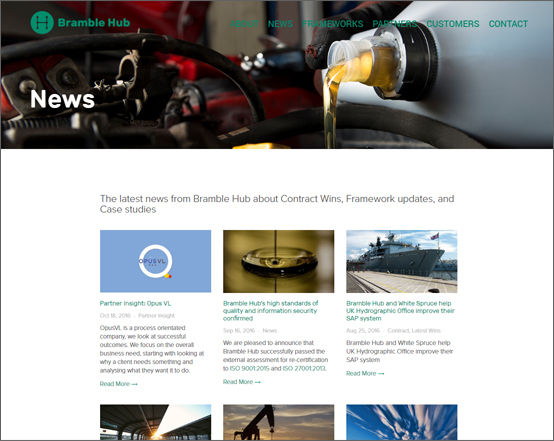 Bramble Hub have over 250 partners and each of these needed a searchable 'space' within the site along with links to features and news items. Squarespace is not a data driven system and we were concerned that this may be stretching the capability of the platform. But with some careful set up and structure we were able to give each of our partners the space they needed. Essentially we used the 'blog' area of the platform to create partner listings and connecting relevant content and events. The blog element of Squarespace is well developed and although there are downsides to not being able to have a downloadable database – the user experience is a good one. There are many aspects of Squarespace that make it perfect for a small business website – the design templates are exceptional and at Build14me we are confident that we can build beautiful sites with more to them than just lovely picutres.